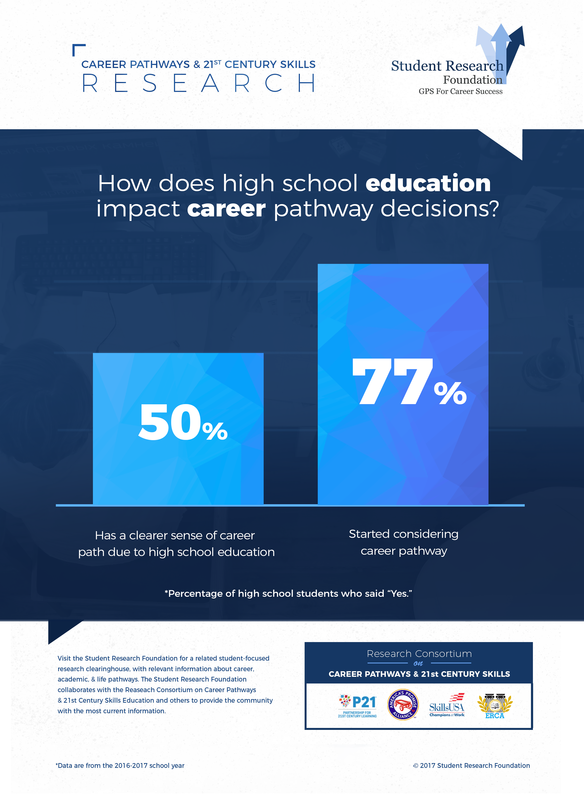 We hear more often that students are beginning to consider career pathways at earlier and earlier ages. But as today’s students dream about their futures, it is essential that they have access to research-based knowledge of those career pathways. Last year, educators from across the country worked with their students to gather valuable information on what today’s learners believe is most important when it comes to career knowledge. 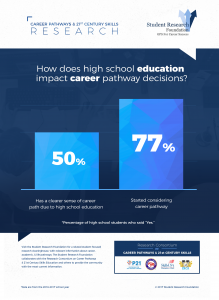 While the results may be surprising to some, they provide valuable insights on career aspirations of our students and how educators can help them achieve those goals. The below info graphic, developed by the Student Research Foundation, provides just one piece of the information gained from the student perceptions data gathered by ERCA and its partners. In the coming weeks, we will share additional data points, information that can help all teachers better guide their students toward meaningful college and career paths. ERCA and all of the organizations it works with are grateful to those educators who take the time to ensure their students’ voices are heard in these important discussions. We realize that much is asked of teachers, with more and more demanded of them each year. By sharing ERCA surveys with their students, these educators ensure that families, colleges, and employers all have a keen understanding of student perceptions and aspirations. Last year’s survey results are already shaping access to the pathways students seek. That is why it is so important for teachers to ensure their students’ voices continue to be heard. ERCA is currently making its 2017 surveys available to educators and their classes. We are thankful to the hundreds of schools the have already participated. For those who have not yet added their students’ voices to the discussion, surveys can be requested here. With a high school diploma in hand, soon-to-be graduates have a great number of choices before them. By participating in ERCA surveys this fall, you can empower your students to make decisions that ultimately align with their interests, passions, and aptitudes.